View samples of Dr. DiTolla's presentations. View Dr. DiTolla's complete bio here. 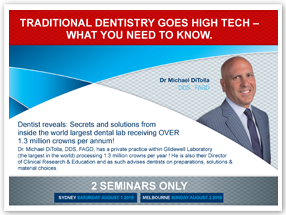 As a dentist who practices within the largest lab in the U.S., Michael DiTolla, DDS, FAGD has access to tens of thousands of doctor’s preps and impressions on a monthly basis and has an intimate knowledge of the common habits of the dentists getting the best restorative results. As a self-proclaimed “average dentist”, Dr. DiTolla has developed techniques that provide exceptional restorative results with a very average set of hands. His mission is to share these techniques with dentists to help them improve their preps, impressions and restorations. When dentists perform better restorative dentistry they are happier, more profitable, and most importantly, the patient recieves excellent restorative dentistry. 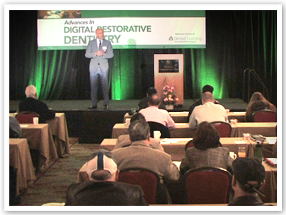 Referred to as one of dentistry's most entertaining speakers, Dr. DiTolla's blend of humor and entertainment keeps attendees awake and helps a day of education become much more pleasant. He uses live clinical video in his presentations to reinforce the learning and increase retention of the techniques. 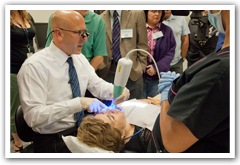 Now available online, view 7.5 hour program, "Traditional Dentistry Goes High-Tech. What you need to know" delivered in Australia, August, 2015. Dr. DiTolla's blend of humor and entertainment keeps attendees awake and helps a day of education become much more pleasant. He uses live clinical video in his presentations to reinforce the learning and increase retention of the techniques. 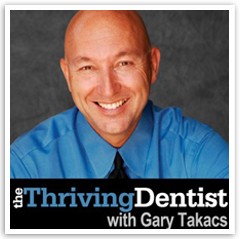 Confessions of an "Average Dentist"